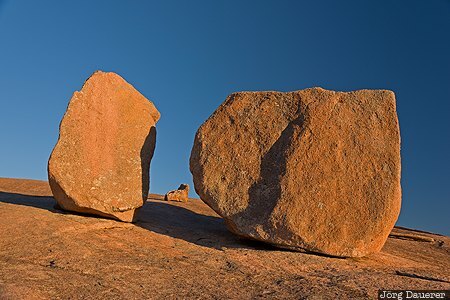 Two lone granite boulders in Enchanted Rock State Natural Area illuminated by warm evening light below a blue sky. Enchanted Rock State Natural Area is in Texas in the south of the United States. This photo was taken in the evening of a sunny day in January of 2015. This photo was taken with a digital camera.